Soft, slippery, and hydrophilic surfaces find critical applications in areas as diverse as biomedical devices, microfluidics, antifouling, and underwater robots. ¬¬Existing methods to achieve such surfaces rely mostly on grafting hydrophilic polymer brushes or coating hydrogel layers, but these methods suffer from several limitations. Grafted polymer brushes are prone to damage and don’t provide sufficient mechanical compliance due to their nanometer-scale thickness. Hydrogel coatings are applicable only for relatively simple geometries, precluding their use for the surfaces with complex geometries and features. 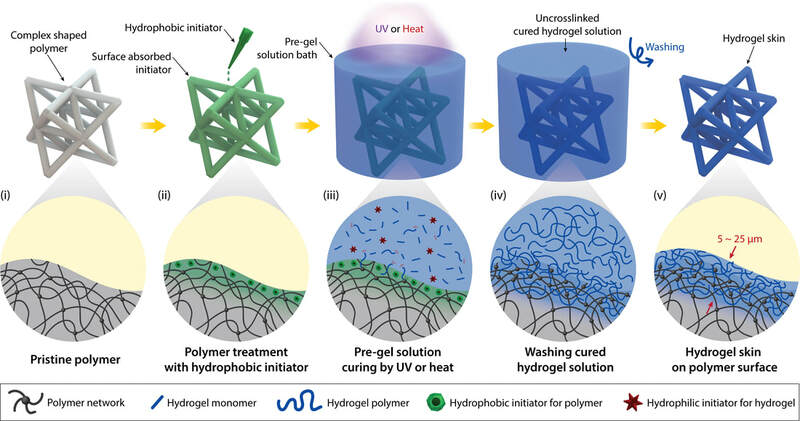 Here, we propose a new method to interpenetrate hydrophilic polymers into the surface of diverse polymers with arbitrary shapes to form naturally integrated “Hydrogel Skins”. The hydrogel skins exhibit tissue-like softness (Young’s modulus ~ 30 kPa), have uniform and tunable thickness in the range of 5 to 25 µm, and can withstand prolonged shearing forces with no measurable damage. The hydrogel skins also provide superior low-friction, antifouling, and ionically conductive surfaces to the polymer substrates without compromising their original mechanical properties and geometry. We further demonstrate applications of the hydrogel skins on inner and outer surfaces of various practical polymer devices including medical tubing, Foley catheters, cardiac pacemaker leads, and soft robots on massive scales.